Thames and Hudson, which Skaer exhibited at Tate Britain in 2009 when nomiated for the Turner Prize, is a frustratingly bitty, and busy, installation which for me simply didn’t work as a whole. It did include a number of interesting elements though, with the skull the real high point. 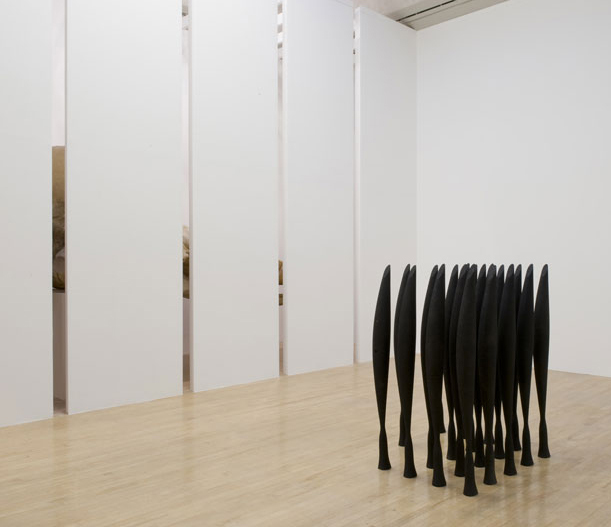 Black Alphabet (After Brancusi), multiple copies of Brancusi’s Bird in Space made from coal and resin, most of which stand in a tight grid formation, is beautiful but sad. The seductively beautiful shape of Brancusi’s work which in the original speaks of movement here becomes static and hemmed in. 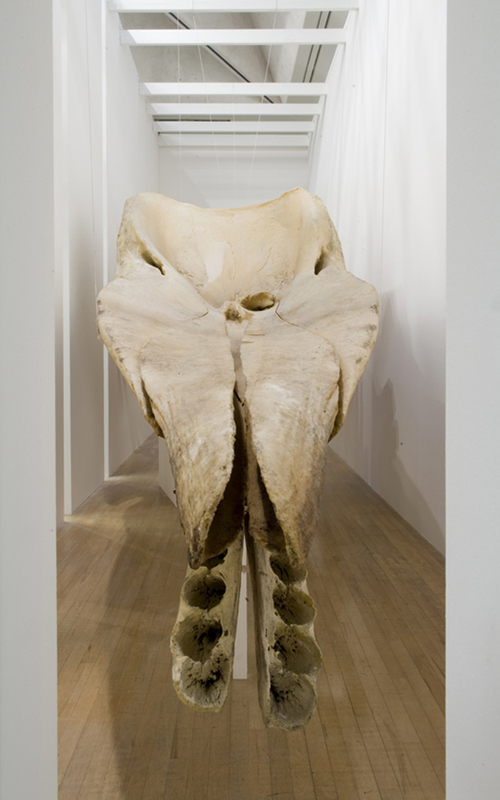 Though in my view the disparate elements didn’t come together to work as a whole, Skaer’s Thames and Hudson did make me think about process, the nature of drawing and printmaking and the ways in which object can become art. 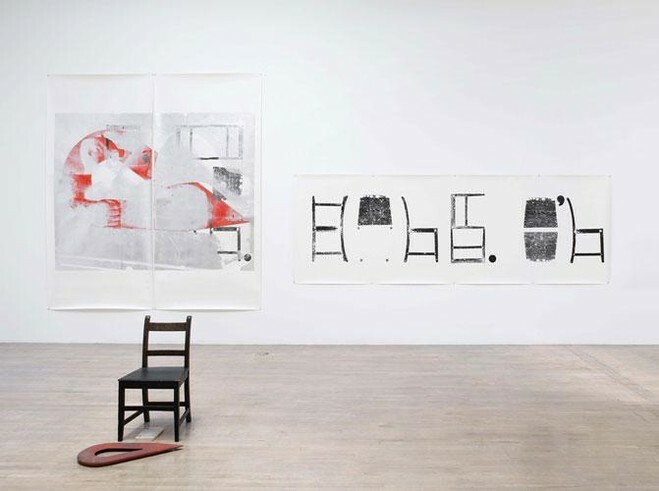 In one part of the space, Skaer displayed a reconstructed chair which she had taken apart and used to make prints. On the wall behind it, a large print recorded chair parts from multiple angles. 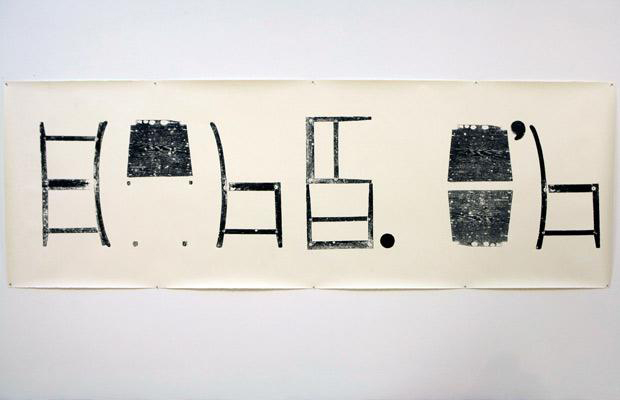 These elements of chair become a series of symbols that seem in a way like an undecipherable code but that also just say chair. This entry was posted in Collage, Drawing, Installation, Printmaking and tagged art, drawing, installation, Leviathan Edge, Lucy Skaer, printmaking, sculpture, Thames and Hudson by Ann Jones. Bookmark the permalink.